Despite a Cristiano Ronaldo double, which gives him six goals in his last five Serie A matches, the 39,000 Bianconeri fans booed their team off at full time. 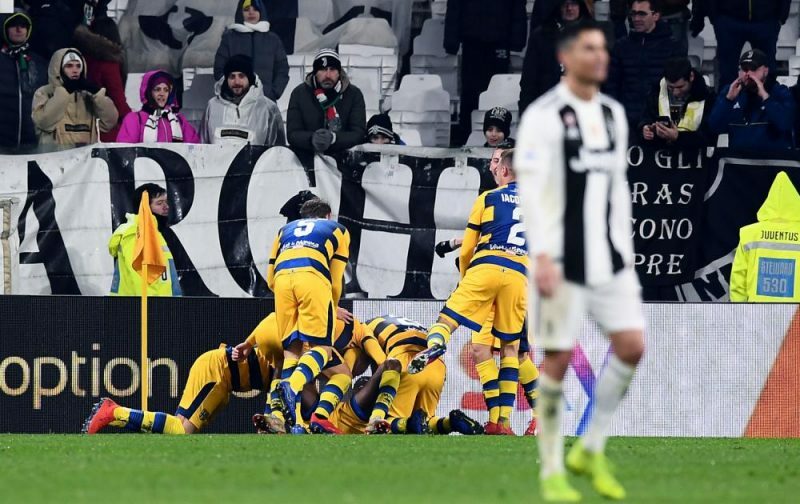 Daniele Rugani got Juventus third which put them two goals up, after Antonino Barilla scored, what looked to be just a consolation for Parma. After a couple of early forays forward through Juraj Kucka and Gervinho, Parma spent the remainder of the first half camped on the edge of their penalty area as Juventus piled on the pressure. Ronaldo had a vicious shot spilled by Luigi Sepe but Riccardo Gagliolo cleared, then Joao Cancelo’s cross come shot was pushed away by the Parma goalkeeper. It should have been 1-0 just after the half hour as the ball fell to Sami Khedira eight yards out, but his dedicate effort cannoned back off the post. The goal did come though just two minutes later as Ronaldo picked up the ball on the left, and falling, managed to get his shot off, with a deflection taking it past Sepe. Just before the break Mario Mandzukic tested Sepe, Miralem Pjanic shot wide before Simeone Iacoponi brought down Martin Caceres for a penalty which was initially given, but after VAR review referee Piero Giacomelli blew for a foul to Parma. A swift counter attack early in the second half from the Bianconeri found Ronaldo on the left, and his dinked cross was perfect for Khedira, but he could only hit the post. Khedira was at it again, and once more being fed by Ronaldo, this time set up on the edge of the area, only for Sepe to deny the German with an acrobatic save. Goal number two followed soon after. Leonardo Spinazzola had the initial strike blocked but Mandzukic was alert and got onto the loose ball which he dinked to the back post, and a stretching Ronaldo, but the ball fell to Rugani who blasted home. However, things weren’t as simple as they should have been as Barilla ghosted in at the back post to get on the end of a Kucka cross and pull one back for the away side. Hope look to have faded two minutes later for Parma as Ronaldo got his second of the match, leaping above Iacoponi and heading Mandzukic’s cross past Sepe. However, Kucka did well to get down the right and his low cross was met by Gervinho unmarked at the near post and he backheeled in to reduce the deficit. Then when it looked like another three points for Juventus, Gervinho popped up in the final minute of the game to grab a point for Parma.